For other posts in this series, click on a number: 2, 3, 4, 5, 6, 7, 8, 9, 10, 11, 12, 13, 14, 15. In a post on this blog last year, I referred to the work of Trinitarian theologian Andrew Root. I return now to his excellent writing--this time to explore his book, The Relational Pastor: Sharing in Christ by sharing ourselves (IVP 2013). In this challenging, yet practical book, Root examines the topic of pastoral ministry in the light of the biblically grounded, Incarnational Trinitarian Theology of Dietrich Bonhoeffer (along with Karl Barth, T.F. Torrance and others). A key theological emphasis of Bonhoeffer's concerned the ongoing ministry of the Incarnate Son of God, Jesus Christ, who continues to share our humanity. Indeed it is in and through the person of Jesus, who is fully God and fully human, that God and humanity are permanently united. And through this "hypostatic union," Jesus shares in the being of every human--truly, he is "God with us." Root, following Bonhoeffer, refers to this as Jesus' "place sharing," noting that by sharing in our humanity, Jesus enables us to encounter and share in the life and love of the triune God. As Paul wrote to Timothy, "There is one God and one mediator between God and mankind, the man Christ Jesus" (1 Timothy 2:5). This being so, Jesus' ongoing ministry is fundamentally relational (personal). He does not "fax" himself in from a distance. Rather, through the Spirit, he actively, and thus redemptively, shares our "place" (lives) by being in relationship with all people - including both believers and non-believers (though it is the believer who is personally--subjectively--experiencing this reality, which is objectively true not within ourselves, but in Jesus--through faith, our life in Christ becomes "real" to us). What does this reality concerning who Jesus is and what he is doing have to do with the practice of pastoral ministry? The answer is, everything. The calling of a pastor (and of anyone else serving in Christian ministry), is to join Jesus in his place-sharing ministry. What that sharing in the ministry of the Place Sharer "looks like" practically, as well as how it is to be understood theologically, is the twin focus of Root's book. In a series of posts, I'll be exploring Root's book--offering representative quotes. I urge you to purchase and read it for yourself. I think you'll find it eye-opening and highly practical. 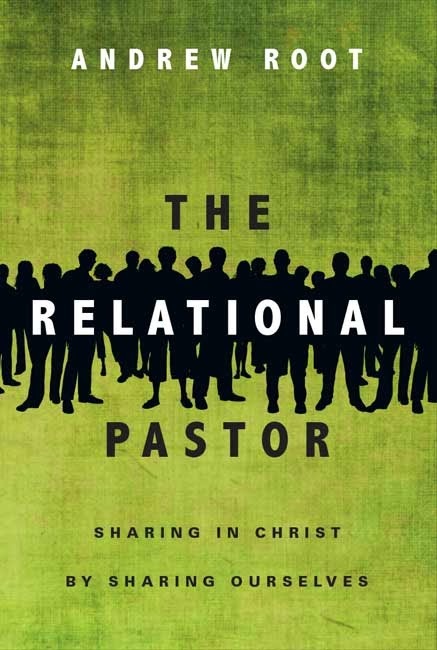 In the preface to The Relational Pastor, Root notes that "at our core we human beings are our relationships." We are, by God's design, relational beings. That being so, we should not be surprised to learn from Scripture and experience "that God encounters us in relationships" (p9). This, of course, is true both because of our relationality as well as the relationality of God himself, who as Scripture reveals is a tri-personal, relational being: Father-Son-Spirit. Given relational people and a triune, relational God, it follows "that pastoral ministry at its base is about facilitating relational encounters." My goal with this book is to make a case that "relationship" is the very goal (not a tool) of ministry. That in sharing in each other's lives we share in God's own life through Jesus Christ.... Pastoral ministry can be nothing more and nothing less than making space for people to encounter the very presence of God... In this book, I claim that space is created in the sharing of relationships of persons (p10). ...becomes a generic term used to signal what people are loyal to. People can be in relationship with things as much as people, with ideologies as much as fellow human beings. So the church's relational ministry becomes about using relationships to win such loyalty from individuals. It becomes about using a relationship to get them to become loyal to the idea of Jesus, as opposed to encountering the person of Jesus Christ (p18). The relational, place sharing ministry that Root advocates is grounded in the reality of Jesus who is the unique divine-human person. As Root reminds us, God became a [human] person in Jesus Christ, and therefore, "personhood becomes the form in which human beings encounter the God who becomes human" (p19). Root explores this concept, reminding us of the teachings of the early church fathers concerning the "hypostatic union"--the relationship between the divine and human natures in the person of Jesus. Divine-human relationships are not merely what Jesus does, they are what Jesus is. He does not use relationship as a tool to influence us to come to him to be saved. Rather the relationship that he has (that he is) with us in his own person, is salvation. And so we understand that Christian ministry--our sharing in Jesus' own, ongoing ministry--is about relationship--not as a mere strategy, but as the very point of our ministry. "In and through relationships people encounter the person of Jesus Christ and [are thereby] given their own personhood--a true personhood free from sin and death" (p19). In the next post in this series, I'll explore what Root contends are the two great witnesses that relationships are ends and not means of ministry. Stay tuned. For a GCI You're Included interview with Andrew Root, click here. Thanks. Sounds a lot like Relational Youth Ministry. Hi Anonymous (James AN). You are correct, the ideas that Root developed in his book "Revisiting Relational Youth Ministry" and in the shorter version titled ("Relationships Unfiltered") are broadened and deepened in "The Relational Pastor." Dear anonymous (John Buchner). You raise a good point. In this case, the "person" that the Son of God became via the Incarnation was a "human person." You are correct in stating that the eternal Son of God was (and is) one of the three divine "Persons" of the Trinity. In fact, humanity has "personhood" in that it is created in the image of tri-personal God. Thanks Ted. Would you agree that just as the Personhood of the Son is mediated through the pastor so also the one who is enjoined by the pastor, in discipling for example, is co-joined (united) with Christ particularly in that encounter? This is a step further than mere agency as it suggests co-incarnation, that is, the discipled one truly becomes united with Christ because the Son was indeed the fulfilment of the pastoral work. Do you think this is what Root is presenting in his book? Can it also be understood sacramentally, either as a priestly occurence, or act of communion, personally and then by sharing the emblems of that shared incarnation? It follows, it may be suggested, that this is the basis and expression of incarnational-trinitarian ministry. Let me know if this accords with your own view or not. Regards, john. Root's perspective on this, which accords with my own, is that the pastor, like any other follower of Jesus, has a particular calling to join with Jesus in his ongoing ministry. Jesus is the Great High Priest--it is his ministry, and he gives us a meaningful part. Communion, as a sacrament of Jesus' presence, is one of the ways that we share, and a powerful one at that.